Probably only seen in England as a cut flower, or even more rarely as a specimen under the protection of a large glass house in a botanical garden, Banksia coccinea is a gorgeous evergreen shrub or small tree with a dramatic, erect habit and spectacular flowers. Commonly known as the Scarlet Banksia, the genus name is in honour of British botanist Sir Joseph Banks (1743 – 1820), President of the Royal Society. Native to the south west coast of Western Australia, its distribution ranges from from Denmark to the Stokes National Park, and then north to the Stirling Range. 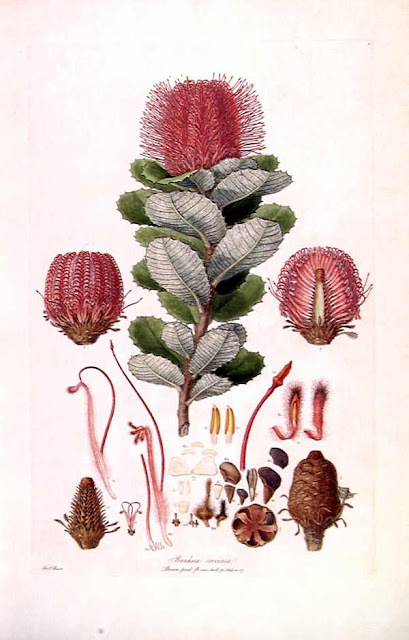 Under favourable conditions you can expect Banksia coccinea to grow to approximately 8 metres in height, however outside of its native habitat 2–4 metres is more likely. It has an erect habit with little lateral spread. The trunk is generally single at the base before branching vertically further up, and is covered with a smooth grey bark. The leaves are roughly oblong in shape with toothed margins and are approximately 3–9 cm long and 2–7 cm wide. 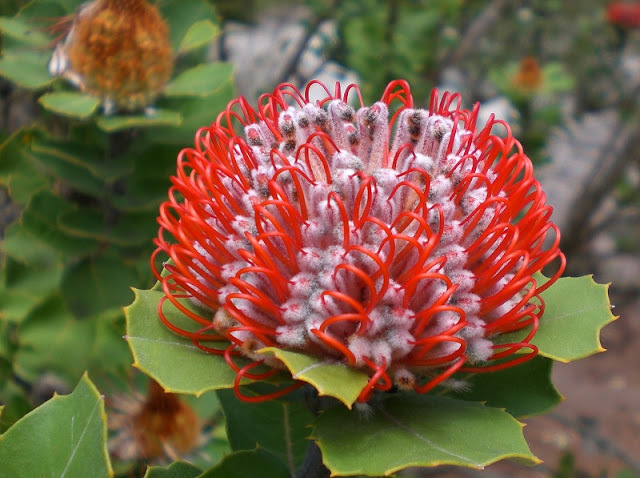 However it is for its outstanding blooms which Banksia coccinea is best known and as such has become one of the most important Banksia species for the cut flower industry. The squat and roughly cylindrical, prominent red and white flower spikes appear mainly in the spring from the ends of one-year-old branchlets. The true flower is white and covered in grey or pale brown fur. The scarlet structures (can be dark red, orange or pink) are the styles (an elongated section of an ovary) which are 4–4.8 cm long and strongly recurved or looped until they are released at anthesis - the period during which a flower is fully open and functional. In its native habitat Banksia coccinea will most likely be seen growing on white or grey sand in shrubland, heath or open woodland. So for successful cultivation it will require sandy, very well drained soils in Mediterranean climates where temperatures rarely fall below 0 degrees Celsius. Be aware that in regions with experience summer rainfall and humidity they can be prone to infection from fungal rots from which they can succumb to surprisingly quickly. The most effective method of propagation of Banksia coccinea is by seed, which unlike many other species within the genus do not require any treatment before sowing. Germination will usually take 12 to 48 days but this can be longer depending on the age of the seed and growing conditions. You can expect these new plants to flower and fruit after approximately three years. The coloured cultivars of Banksia coccinea can only be propagated by taking cuttings however they are notoriously slow to take and can often fail before rooting has taken place.